Image CC-BY-SA by Jake Beech. 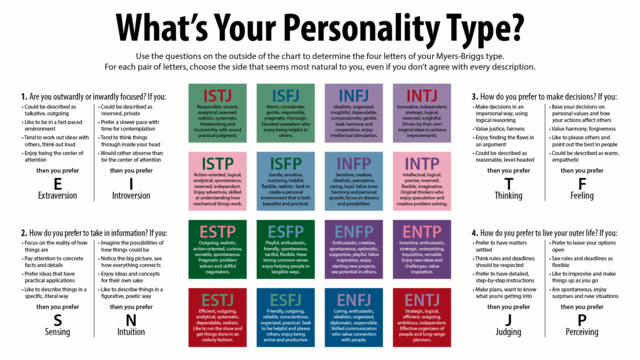 Over the years I’ve seen many people refer to the Myers-Briggs personality types, often giving a four-letter code to describe themselves or other people. I’ve never liked this sort of pigeonholing of people and have long resisted looking up much about the Myers-Briggs classification. I’ve specifically avoided any sort of test which might purport to tell me what my “personality type” is. I don’t want to be known by a shorthand label which will almost certainly misrepresent critical aspects of who I am. But I had my curiosity piqued yesterday and actually found myself looking at the Wikipedia page for the Myers-Briggs stuff. And I saw the image shown here. Zooming in to read the text, I found it gave a short list of tendencies designed to determine which side of the four different personality dichotomies you belong to. Unable to avoid the temptation now, I read some of them, and immediately found a problem. The very first choice at upper left, trying to decide if you are extroverted or introverted, asks if you could be described as (a) talkative, outgoing, or (b) reserved, private? Well, I think I could easily be described as both (a) and (b). The next question asks if you (a) like to be in a fast-paced environment [yes! I do! ], or (b) prefer a slower pace with time for contemplation [yes! I like that too!]. I really like fast-paced stuff and I really like slow-paced stuff with time for contemplation! Okay, moving on to question three: do I (a) tend to work out ideas with others, think aloud [yes, I do this all the time], or (b) tend to think things through inside your head [yes, I do this all the time as well]. You can see where this is going. The final question for the extrovert/introvert “dichotomy” asks if I (a) enjoy being the centre of attention [why yes, I do], or (b) would rather observe than be the centre of attention [and yes, I often feel like this too]. Moving on to the sensing/intuition axis, the first question asks do you (a) focus on the reality of how things are [yes, I do, very much so; I’m very pragmatic and realistic about things] or (b) imagine the possibilities of how things could be [yes, I do, very much so; I love fantasising and dreaming of various possibilities]. Second question: do I (a) pay attention to facts and details [yes!! extremely so, I am very detail-oriented], or (b) notice the big picture, see how everything connects [yes! very much so! I am very good at this – people at work have commented how good I am at this sort of thing]. Third question: Do you (a) prefer ideas that have practical applications [yes, I love ideas with practical applications], or (b) enjoy ideas and concepts for their own sake [yes! I love ideas with no practical application]. Fourth question: Do you (a) like to describe things in a specific, literal way [yes! I do this all the time; I really enjoy technical writing for work purposes, describing in detail some highly technical algorithm], or (b) like to describe things in a figurative, poetic way [yes! I love doing this sort of thing; I really enjoy writing poetic descriptions and embellishing things I write with metaphors and literary asides and so on]. Okay, let’s try the third axis: thinking/feeling. Even just the title of the two “sides” has me sure I’ll fit into both. Question one: Do you make decisions (a) in an impersonal way, using logical reasoning [of course I do, it’s only sensible to use logic and be detached for many important decisions], or (b) based on personal values and how your actions affect others [of course I do! What kind of monster would I be if I didn’t base my decisions on my personal values and take into account how they would affect others??]. Second question: Do I value (a) justice and fairness [yes! of course I do! ], or (b) harmony and forgiveness [yes! of course I do!]. Third question: Do I (a) enjoy finding the flaws in an argument [well… sort of, here’s one I need to qualify; I get the subdued satisfaction of a job well done, but not hedonistic-style enjoyment out of this – oooh… have we finally found a distinguisher? ], or (b) like to please others and point out the best in people [well… sort of; I mean, I like to make people happy, but I’m not above criticising them if I think they deserve it; I’m definitely not a sycophantic yes-man]. I’m not sure how to call this one, other than another tie. Fourth question: Could I be described as (a) reasonable, level-headed [I like to think so, and I honestly believe I come across that way to others], or (b) warm, empathetic [I like to think so, and I honestly believe I come across that way to others]. The fourth and final axis: judging/perceiving. Do I prefer to (a) have matters settled, or (b) leave your options open? Well, I like both. I love being meticulously organised, and I also love flying by the seat of my pants. Question two: Do I (a) think rules and deadlines should be respected, or (b) see rules and deadlines as flexible? You know… I like to strike a sensible balance. Rules and deadlines should definitely be respected, but that doesn’t mean they can’t also be flexible if needed. Question three: Do I (a) prefer to have detailed step-by-step instructions, or (b) like to improvise and make things up as I go? I love both! It’s great to have step-by-step instructions, if I want to go that way and do a thing exactly as other people have done it, but I also love modifying and improvising to come up with something unique. (Examples: in cooking, sometimes I follow a recipe to the letter, sometimes I throw caution to the wind and modify like crazy. Playing music: sometimes I want to reproduce the exact sound of a recorded song using a detailed score, sometimes I want to let loose and do whatever I want.) Fourth and final question: Do I (a) make plans, want to know what I’m getting into [yes, very much so! ], or (b) am I spontaneous and enjoy surprises and new situations [I love surprises and dealing with unexpected situations spontaneously]. Well. Maybe this says something about me and my personality, or maybe it doesn’t. All I know is that the Myers-Briggs types are ridiculously narrowly specified and don’t seem to apply to me, not even in the slightest. Every single “dichotomous” question they ask, I have pretty much an equal reaction to both sides. I like all sorts of stuff. I like being quiet and contemplative, I like being brash and outgoing, I like to plan and think things through in detail, I like to just go and spontaneously decide what to do on the spur of the moment, I like to be literal and meticulous and logical, I like to be carefree and expressive and poetic. Why pigeonhole yourself into some “personality type”? You’re missing half the fun of being alive! This entry was posted on Friday, 8 August, 2014 at 09:57	and is filed under Personal, Science. You can follow any responses to this entry through the RSS 2.0 feed. You can skip to the end and leave a response. Pinging is currently not allowed. I have the exact same reaction to these personality tests as you do. I am full of contradictory interests and characteristics and refuse to choose one at the expense of another. It’s all well and good to try and categorise the world and classify behaviour (where would science be without this?). But sometimes you just need to let people be who they are.